To follow our updates or our blog, please submit the form below or follow us on Facebook! Just like the people of the state, the stories found in Wild, Wonderful ‘n Wacky, South Cackalacky are original and spirited. 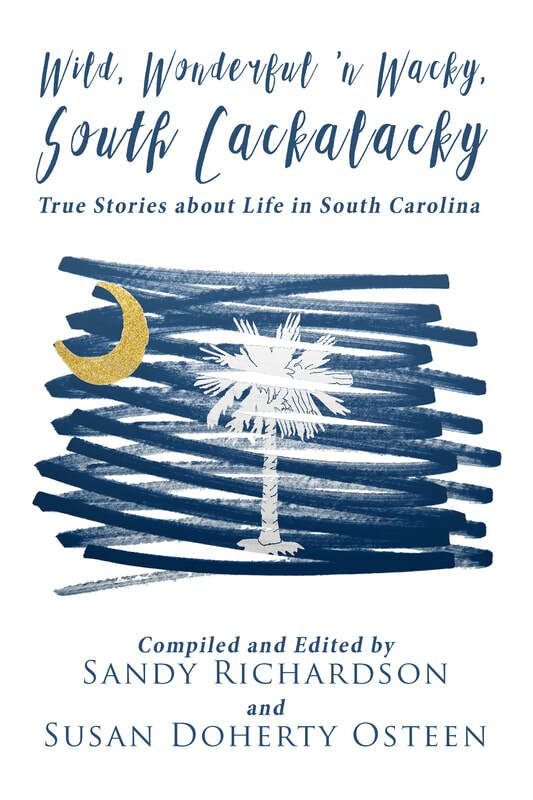 These true accounts about life in South Carolina are personal stories written from the heart by the people who live here. They comprise a testament to the state slogan “Smiling faces and Beautiful places” and create a collective, personalized account of who were and who we are—strong individualists who have lived, loved, laughed, and cried together. Read all about us—right here. Be amazed. Wonder at it all—life in our beautiful state, South Cackalacky. **Please scroll down to read quotes from the stories. -Terry Kay, a 2006 inductee into the Georgia Writers Hall of Fame, is the author of 17 published works, including The King Who Made Paper Flowers, Song of the Vagabond Bird, The Greats of Cuttercane, Bogmeadow’s Wish, The Book of Marie, To Dance with the White Dog, The Valley of Light, Taking Lottie Home, The Kidnapping of Aaron Greene, Shadow Song, The Runaway, Dark Thirty, After Eli, and The Year the Lights Came On, as well as a book of essays, Special K: The Wisdom of Terry Kay, and two children's books, The Seventh Mirror and To Whom the Angel Spoke. -Prioleau Alexander, Author, Dispatches Along the Way and You Want Fries With That? Review of Wild, Wonderful ‘n Wacky South Cackalacky: by Judy Millspaugh Anderson, M.D. (co-author of Kissing the Underbelly, XLibris, 2011.) I suspect many South Carolinians will buy this book because of the promise of a nostalgia “fix”, and they will not be disappointed. They are sure to find something they can relate to. The material in this anthology will remind them of things they experienced as they were growing up, or perhaps things their parents and grandparents told them about growing up in “South Cackalacky” in previous eras. For me though, as a transplant from the far North, (where I was in turn a transplant from the Midwest) it was a window into my new adoptive culture. Everybody in the country learns the basics of regional differences. The West had “Indian wars”. California had the Gold Rush. New York had Ellis Island, with Italian, Irish and Jewish immigrants. OK, ho, hum. We’ve heard all of that. And the South had slavery, and then we had the Civil War, and they lost, right? But what does that tell me about the people I meet who were born several generations after all that? Not much. What went on between the Civil War and the present day? What sort of things shaped the lives of all the people I meet in my new home? This book tells me. It presents the story of the South in the Twentieth Century, with detail and texture that will not be found in history books. I had read about the Orangeburg Massacre, but discovering that my friend Annette Reynolds had been there gave it a whole new dimension, and knowing that she’d been there added to my understanding of my friend. Another friend, Barbara Covington, gave me a glimpse into what it feels like to swing on a porch glider on a languid Southern summer evening, which is as different from a bitter cold and icy Wisconsin winter as any childhood could be. Similarly, those contributing authors that are not included among the friends I have found since moving here nevertheless add to my understanding of this culture that I joined late in life. This book is a glimpse into a rich and vibrant culture, and tells me far more about South Carolina and its people than any history book ever could. I thoroughly recommend this book for native South Carolinians and for transplanted Yankees as well. You will want to read it more than once. This book is a treat - every bit as delicious as a banana popsicle on a hot summer afternoon. It made me want to put on my seersucker shortie pajamas and sleep on the porch! The writing is fabulous. Each and every writer skillfully captures and entertains you with their treasure of stories that told of a way of life that no longer is. Growing up in South Carolina during that period of time was not just a place that you happened to be at that point in your life. It was a culture that contained a spirit that penetrated deep into your soul and molded and shaped you into what you would later become. It was a slower, gentler, kinder time, a time of compassion, a time of deep love, dedication and commitment to family and friends. Yes, we are wacky here in South Carolina. Who else could have thought of the possum trot and the chitlin' strut. Our lives were filled with lots of silliness, laughter and an appreciation of the moment and the little things. This book should remind us and encourage us all to strive to have a bit more of that today. So, go fix that glass of sweet tea, sit down and read this book. Take a nostalgic trip down memory lane or catch a glimpse of what it was really like growing up in South Carolina "back then". You will be glad that you did. Oh, and bless your heart ya'll. Want to put down that cell phone, turn off the TV, and disconnect for a while from that constant barrage of all-so-important newsflashes that keeps us so frantic? Are you old enough to remember a time before? Do you remember the simple pleasure of sitting around the dinner table or relaxing on the back porch, listening to your grandparents and aunts and uncles reminiscing? Do you remember the thrill of their stories coming to life in your imagination? If so, grab a copy of Wild, Wonderful 'n Wacky, South Cackalacky and journey with the authors as they share their memories with you. The title of the book says it all, and it will not disappoint! Wild, Wonderful n Wacky South Cackalacky is a fantastic read, full of regional tales that will make you wish you could explore all corners of our beautiful, history-laden South Carolina! Susan Osteen’s story, “Ghosts on Golf Carts” is a page-turner, forcing you to search trip advisor for travel plans to Daufuskie Island to experience the haints yourself. The contributors to this collection of stories are fantastic, knowledgeable, fun, and scintillating. Open up the book to discover the true oddities, mysteries, and joys of our South Carolina culture! Bronwyn M.
What an enjoyable read. Short stories that take you back to the good ole days through the minds of "when one was young"! The best part of this book is that one can read one story and leave the book to return to read the next one. One story will not be enough though as it will bring the picture of the time and day in which it is written to make you want to read another and another! Pictures always invoke the suggestion of the place being shared but this is not necessary for each read. "I was provided an advance reading copy of this book. I received no payment or benefit for providing an honest review." Kelly M.
I received an advanced reader's copy of this book. I received no payment or benefit for providing an honest review. Caveats aside, this is a terrific book. The nostalgia for old South Carolina is especially vivid, with wonderful details about the food, toys, and pastimes of childhood. I could feel the heat and humidity on every page . Lynda D.
Wild, Wonderful n’ Wacky, South Cackalacky dishes out a veritable feast of tales about days- mostly gone by-in South Carolina. Its wide ranging menu features everything from hunting, football and ghosts to family, religion and race-not to mention the surprise inclusion of circumcision. Many of the stories are strong in terms of craft. All have a decided flavor of authenticity, and many are infused with inimitable Southern humor. What a delightful read! These stories give the reader a back porch view of what growing up in the Deep South in the fifties and sixties is all about. Tree swings, root doctors, skinny dipping, bean shelling, haints, and racial tension all make their appearances as these true Southerns navigate their way through the tricky business of becoming adults in a culture that is steeped in tradition and history. The characters talk openly and honestly with the reader about the gifts that the generations before them hand down to them. And about their coming to terms with what those gifts will mean to them, and to the generations after. by Elizabeth R.
"My God, Betty. You people even wear pearls to bed,” I gasped. We fled with our cart through the checkout line and raced to our car. "An Ordinary Life in Extraordinary Times"
On the day that I arrived at Limestone College, all I saw was a sea of white faces. They all looked the same, and I could not distinguish individuals. In my mind, every twig or leaf that I touched below the water’s surface was a moccasin striking my naked little pecker making it swell up twice the size of me, or an alligator or turtle biting it completely off. ​effect as a slap across my knuckles. “Smudging with white sage that you’ve lit to create smoke in every room will do it. Perhaps a circle of sea salt around the house if that didn’t work.” Two sisters offered to come over during the next full moon to help out. turn on you every time. I’ve been unable to find anywhere else. ​ "Waiting for Norman Rockwell"
yet, the times I see him, he speaks to me without saying a word. He was a portrait waiting to be painted and placed within a frame. Waiting to be noticed. and by summers end the body was exhausted, the soul weary. A busy morning—we began right after breakfast moving root-bound plants that wintered in the flower house to long wooden tables in the backyard. As Nanny loaded a rusty wagon as full as it could get for one trip after another, I plundered underneath shelves through lamb shaped planters and pastel vases tangled in spider webs. Grandmama doled out a quarter to each of us to spend while she and Aunt Celia searched for hair-pins and cold cream. My cousins and I perused the toy aisle and fingered the cheap plastic toys until we all decided on the same thing. Most often, we chose miniature troll dolls with long rainbow colored hair, or small metal cars and trucks to add to our sand village. Paddling only to avoid downed logs or to navigate the sharp turns, we drifted with the current, tossing small spinning lures with ultralight rods and reels, catching redbreast, the brightly-colored panfish closely related to bluegill. ​the sapling again for fear of us spotting it. ​For several years, that candy was the only treat the children got, and Sammy Lee's music and dancing brought the people of the town a brief and welcome respite from the harshness of their lives. Back then, eye-rolling had not been thought of as a way to express feelings; instead, we grew adept at arching one eyebrow, an expression inspired by the big-screen movie actresses at the time. Scarlett, herself, was particularly good at the expression. "A Bushel and a Peck "
Raw speckled beans glisten like semi-precious stones. They brandish the purples of amethyst, from pale lavender to veins shocked with port wine. They shine like opals, translucent gems traced with fire. From experience, I know this to be true, and I know that before their full array can be properly admired, a veritable heap of them must be shelled. Time and again, she scared me speechless with body parts in cellars, whispers in the night, a dead woman tapping at the window. I can only suppose my mother allowed me to hear about people being buried alive because she wanted to hear about people being buried alive. In any case, these anecdotes could be depended upon to quicken the pace of our shelling. My aunt—she of weak wrist and a Friday standing appointment with Audrey, queen bee of hair-dos and manicures in our small realm—usually showed up. We were begrudgingly glad to see her. by David F. McInnis, Sr. Sometime during my fourth year, my mother broke the news that I was going to undergo a very exciting experience. My tonsils and adenoids would be removed to prevent the sore throats and sinus problems that had plagued my young life. But she neglected to mention I was also to be circumcised at the same time. The doctor advised my mother to sit me out in the yard with no clothes on below my waist and to place my wounded member directly in the sun. This would allow me to soak up the healing ultra violet light rays of the sun. Mama's quilts for our bed, and we were set to enjoy gazing at the stars, listening to the frogs in the near-by pond, and to the loud sound of cicadas. "The Footnotes: Story of a Beach Band"
And the surf, sand, and suds are a combination destined to bring on a party. It’s made many a mama worry about her daughter. With a shuffle beat and a shuffle step, and one’s free hand positioned as if holding a cold can of beer, the movements of The Shag are smooth and cool so as not to spill a drop. ​ "The Legend of a Good Man"
Gossip of what had occurred spread like mosquitoes on a rainy night. Once the white citizens of Spartanburg heard that one of their own had been violated, they took guns, axes, bats, and canes straight to the jail house. through busted windows, and a dilapidated staircase rising up to darkness. As I floated to sleep, I had the sensation I could not breathe. I remember telling myself to wake up, and I was quite aware I was having a strange dream in a strange bed on a strange island. But I could never quite pull myself into wakefulness, and the sense of suffocating lasted until 9 a.m. when Donny rapped on my door. He continued the activity night after night. Before he knew it, he had completely covered his jacket, trousers, and hat with buttons. He went on to cover a coffin, a Chevrolet Chevette, and even a toilet with buttons. By the time I came along in the early ‘60s, many things and ways of life in the South had changed, even people, but my daddy wasn't one of them. Raised during a time when women didn’t wear pants, much less camouflaged ones, it didn’t occur to him to take me hunting. Perhaps he thought a girl couldn’t keep up, would make too much noise, would become bored, or would get upset at the sight of a dead animal. But each time he flung open the kitchen door after a hunt, rubbing his cold hands together and smelling like the sweet woods, I longed to go where he had been. “I’m going to get out.” I said. a beautiful smile on her face. I opened the door and stumbled out. “I’m getting out…” I drawled. and I was staring at my girlfriend’s tail lights as she sped away. Her teeth looked like someone stuffed firecrackers in her mouth and sewed her lips shut.